This PD3 was delivered to Ramsbottom UDC in November 1967. The chassis is variously described as PD3/4 or PD3/14, the confusion arising because Leyland reclassified its chassis codes at around that time. PD3/4 is probably correct. The body is by East Lancs and was delivered as H41/32, but, again, the capacity is now sometimes quoted as 70 seats. The Ramsbottom fleet was absorbed into SELNEC on 1/11/1969, and FTF 702F was withdrawn by SELNEC’s successor, Greater Manchester PTE, in December 1980. It was sold initially to Gold Star Coaches in St Asaph, North Wales, who then disposed of it to Alpha Coaches of Bootle in 1984. It didn’t stay there for very long, because in July 1984 it appeared in the fleet of Black Prince of Morley, who ran it right up to the end of that firm’s operation in July 2005. First Group sold it in September 2006 to Dews Coaches of Somersham, who added it to their small heritage fleet. FTF is seen here on wedding duties in St Ives (the Huntingdonshire one) on 5/9/2015. In my own days in St Ives, Ronny Dew ran a range of Bedford coaches however there were many Leyland PDs operated around the area by Whippet Coaches. Seven ex-Trent 72-seat rear entrance PD3/4s were in this mix but I don’t recall any forward entrance ones in Mr Lee’s fleet. Additionally there were a good number of PD2s most of which also came from Trent. I remember one low-bridge model from East Midland that I had previously ridden whilst it was with working on EMMS home territory. A stunning all Lancashire product looking as good as it did 49 years ago when I first saw it. I prefer preserved vehicles in their original livery but this presentation is 100% plus. Nice view, Roger. I have submitted one to Peter with the bus in "Black Prince" guise, at Duxford, if he’d like to dig it out. This fine vehicle was the last bus to run on scheduled Black Prince with one of the Cowther family at the wheel. 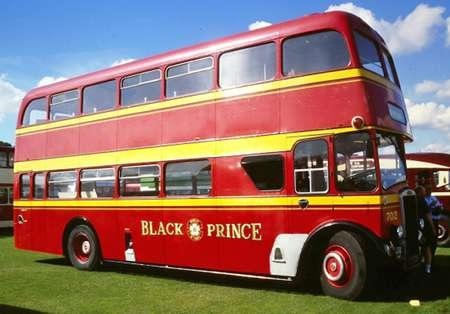 Black Prince also had a Roe bodied Leyland Titan that was new to Farsley Omnibus. The whereabouts of this bus would be appreciated. I was lucky enough to have a ride on it last year at the Peterborough Bus Rally and it was in fine fettle. A friend of mine in his early twenties was at the wheel. For a young lad brought up on modern ‘aim and point’ buses he managed the heavy Leyland manual transmission admirably. As Phil points out, this PD3 in Dew’s colours is a fine example of a traditional livery that stands head and shoulders above the ‘modern’, indulgent, eye offending absurdities that blight bus fleets today. 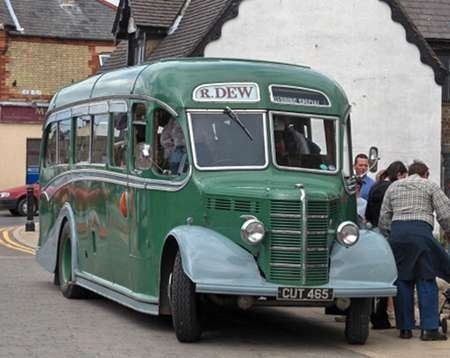 Dews (the firm itself has abandoned the apostrophe) does have a Bedford OWB coach, CUT 465, of 1944 vintage with a later Duple Vista C29F body of 1952. It has made a brief appearance in the Foyle’s War TV series, though purists would declare that its later body makes it an anachronism in a wartime drama. It is seen here in the fenland town of Ramsey, providing a service to the former RAF Upwood airfield during the 1940s August weekend event of 2006. The gentleman facing the camera from behind the nearside mirror is Simon Dew who currently runs the business with his wife Debbie, though his father, David, still has active involvement. A slight diversion, I know this is not a model bus site but here is a model I made of the same vehicle in original Ramsbottom UDC livery. It is 00 scale 4mm to 1 foot made from a plastic kit. This picture of "FTF" which I took as it waited to operate the very last ever Black Prince departure from Leeds Vicar Lane to Morley at 2315 on Saturday 30th July 2005. The conductor is Brian Crowther, founder of Black Prince, and the driver is his son David – the route is a tricky one with many stops on the steep Churwell Hill. The bus was virtually full all the way, and one well sozzled client was heard to splutter "What are they doing with old London Transport buses on here ??" Such is the lamentable understanding of many of the lay public about public transport I’m afraid. I have no hesitation in saying that David’s impeccable performance gave us the finest ride on a manual PD3 that we’d ever experienced, not the easiest machines to handle on hills with heavy loads, and the journey was a credit to him and his Dad, who didn’t show their emotions too dramatically but it must have been a very emotive hour for them. Nice views of ‘little’ and ‘large’, Philip and Chris! Could Philip please point us in the right direction for obtaining such a kit? The kit was made by a company called Classic Model Company (earlier named MTS) but I am not sure if they are still available. They may be available on e-bay. 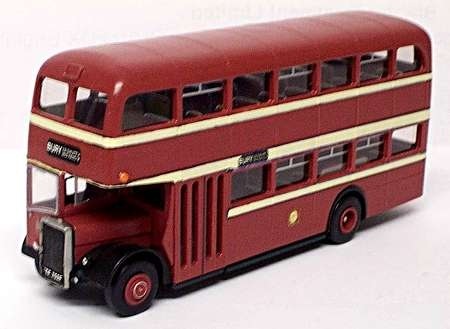 I did hear the Model Bus Federation had bought the moulds so they many be obtainable through that organisation. The kit is a one piece plastic bodyshell with seating, wings, wheels etc included to be added separately. As kits go they were quite easy to build. 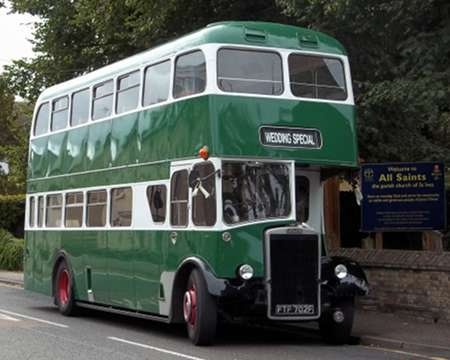 They were offered as Leyland PD3 with exposed traditional radiator or St Helens front, AEC Regent V and Daimler CVG6. Transfers were included for Ramsbottom, Haslingden, Bradford, Huddersfield and Black Prince. The firm also did a Bristol FS with transfers for various Tilling/NBC fleets plus Central SMT. When available originally they cost about a fiver so were excellent value and very good quality. Hope this helps. That green and white livery with red wheels is very attractive. Shades of Nottingham Corporation Transport at its best in terms of livery. On balance I think I favour this one over the other good liveries that this vehicle has borne. I myself have been lucky enough to drive FTF 702F whilst with Dews, I took it out on a number of occasions on trips to local rallies etc with members of the Cambridge Omnibus Society. A very pleasant bus to drive. 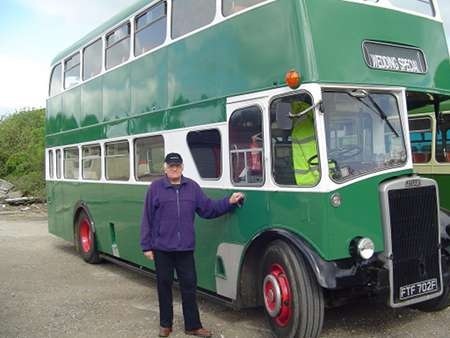 The pic shows me with it at Great Yeldham Transport Museum open day in May 2011. It has the obligatory ‘Wedding Special’ on the blind to advertise the fact its available for wedding hire. The destination box being on the small size it would have only shown minimal info when in service. 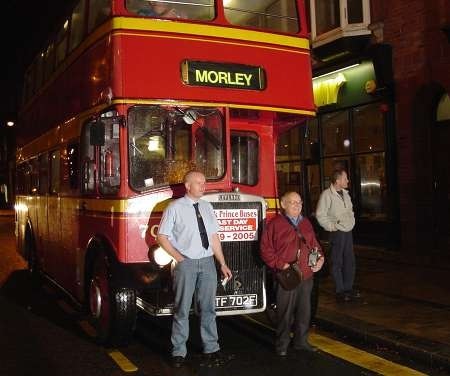 I think someone asked about the Farsley bus – HNW 366D. Sadly this was burnt out some years ago. After Black Prince HNW 366D moved to Classic Coaches and after the demise of the latter went to auction (with no COF) but was set on fire in the auctioneers yard after its auction. BTW it had spent a brief period, joining HNW 365D, at Hardwick’s in Scarborough after WA ceased Farsley operations in the late 60s. Bancroft and Powers bought my grandfathers business Dec 1968, The Bedford CUT 465 was sold to Morton Potter Leicester I think in 1966, I have recently purchased a model of this bus in Dews colours. The DVLA list owner changes of FTF 702F as follows which differ slightly from those quoted by Roger Cox. As a matter of interest Dews have recently sold the Leyland to a previous owner in Liverpool, this looks to be Taylor who traded as Alpha Coaches, Bootle. Travelled on this many times when it was Selnec 6408 and based at Bury, in the mid 70s. Most unusually, this Ramsbottom PD3 was allocated to Rochdale depot by Greater Manchester Transport in the mid 1970s. Rochdale Corporation had never bought Leylands since 1940 and Rochdale’s own Leylands were all withdrawn by 1956. A couple of withdrawn Bolton Leyland PD2s with manual gearboxes were sent to Rochdale in the 1970s for driver training purposes, then 6408 appeared in passenger use. 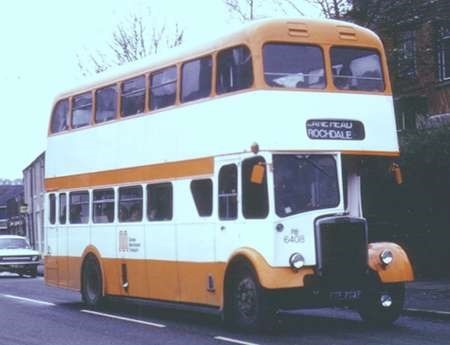 It was the only front-engined Leyland to operate from Rochdale’s Mellor Street depot after 1956. I’ve recently received an email with a photo showing that this PD3 has now been repainted back into its original Rawtenstall livery.